Abstract: In order to protect their food from competitors, ball-rolling dung beetles detach a piece of dung from a pile, shape it into a ball, and roll it away along a straight path . They appear to rely exclusively on celestial compass cues to maintain their bearing [2, 3, 4, 5, 6, 7, 8], but the mechanism that enables them to use these cues for orientation remains unknown. 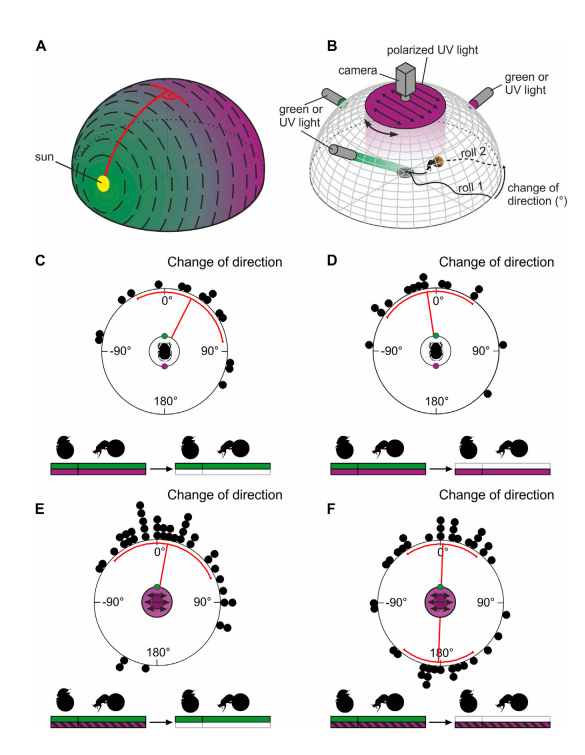 Here, we describe the orientation strategy that allows dung beetles to use celestial cues in a dynamic fashion. We tested the underlying orientation mechanism by presenting beetles with a combination of simulated celestial cues (sun, polarized light, and spectral cues). We show that these animals do not rely on an innate prediction of the natural geographical relationship between celestial cues, as other navigating insects seem to [9, 10]. Instead, they appear to form an internal representation of the prevailing celestial scene, a “celestial snapshot,” even if that scene represents a physical impossibility for the real sky. We also find that the beetles are able to maintain their bearing with respect to the presented cues only if the cues are visible when the snapshot is taken. This happens during the “dance,” a behavior in which the beetle climbs on top of its ball and rotates about its vertical axis . 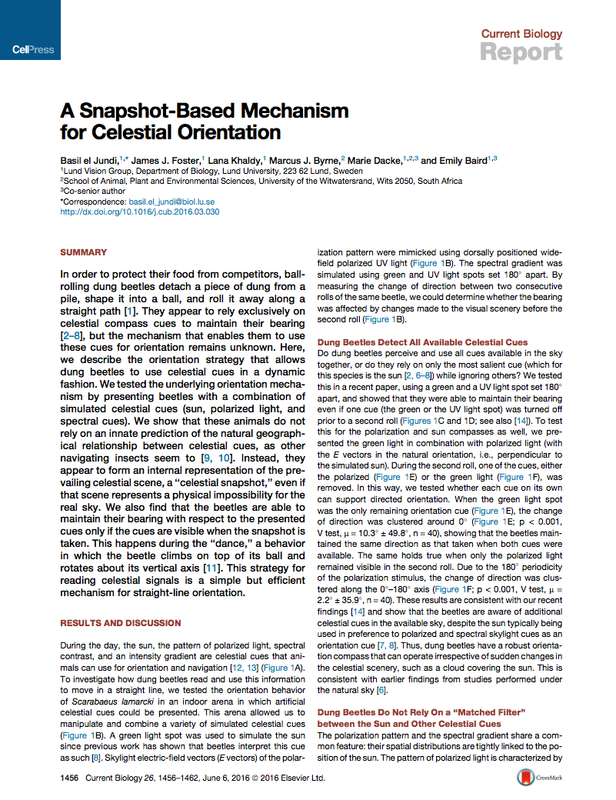 This strategy for reading celestial signals is a simple but efficient mechanism for straight-line orientation.